Movie Ramble: This is My Street. Scottish born Sidney Hayers worked in both television and feature films as a director, a writer and producer. His TV credits include such popular series as The A-Team and The New Avengers while his feature film career included the 1961 British noir Payroll. 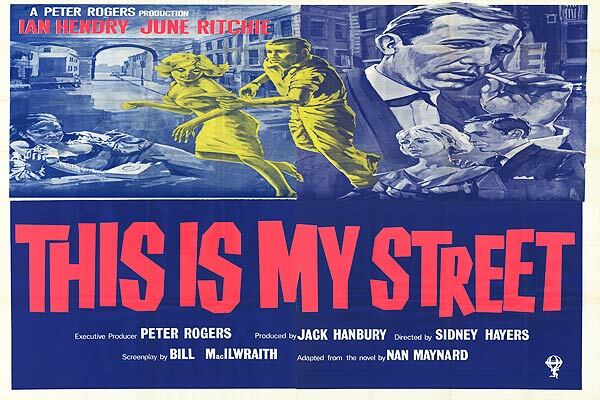 Two years later he went on to direct the kitchen sink drama This Is My Street (1963). Based on a novel written by Maidenhead housewife Nan Maynard with a screenplay by Bill MacIIwraith whose career started when he wrote the script for Linda (1960) which was a short film that starred Carol White, which played in the cinemas as the supporting feature to Saturday Night and Sunday Morning. Jubilee Close, Battersea is a shabby suburban London back street which houses amongst its drab rundown terrace properties a cross section of working class families. Married to Sid (Mike Pratt) a man she does not even like, let alone love Margery Graham (June Richie) lives a life of drudgery with only her five-year-old daughter (Sheraton Blount) to break the monotony. 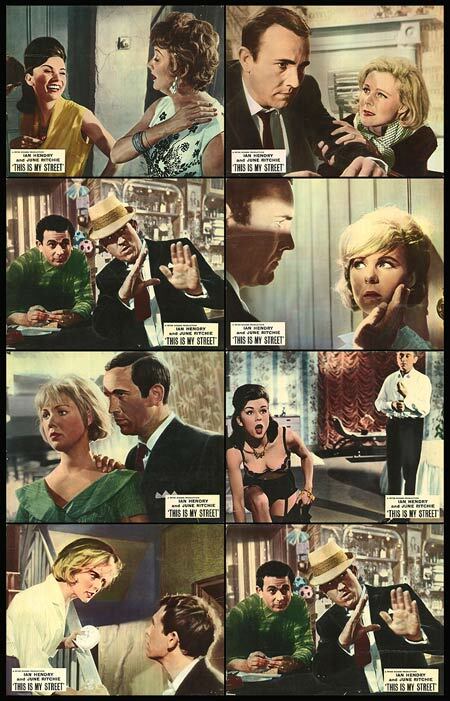 In the next identical 2 up 2 down lives her mother who rents out a room to a flashy salesman and co-owner of a night club Harry King (Ian Hendry). King is constantly making passes at the bored housewife who at first ignores his advances but as her marriage deteriorate even further she gradually begins to fall for the philandering King. But when Margery's sister Jinny (Annette Andre who appeared opposite Mike Pratt in Randall and Hopkirk) comes home from college Harry begins to turn his attention away from the now doting Margery with some unexpected results. An appealing drama of its time, which to the scripts credit includes some interesting and realistic characters (look out for an early appearance from a young John Hurt) and not just the ones that fill the leading roles. Well filmed and well acted it revives the acting partnership of Richie and Hendry first seen together in Live Now, Pay Later (1962). It also highlights the sordid squalor and poverty that was associated with the back streets of London in the 1960's and for that reason could be described as a forerunner to TV drama's like Up The Junction (1965) and the ground breaking Cathy Come Home the same year and not forgetting feature films like Poor Cow (1967).